she bears me fair in hand. the manner of his teaching. Litio, my friend, is it possible that Bianca likes anyone more than me, Lucentio? If she’s just leading me on, she’s doing it very well. To convince you of what I’ve said before, just watch the way this man teaches her. Now, did you learn from what you’ve been reading? What have you been reading, master? First tell me that. I read what I said I would: The Art to Love. And I hope you become master of your art. While you, my dear, become mistress of my heart! [to Tranio (as Lucentio)] They’re certainly moving quickly! Do you still swear that Bianca loves nobody more than Lucentio? Oh cruel love! Fickle women! I’m telling you, Litio, this is unbelievable. He reads the books he uses in his teaching profession. He’s studying what he’s practicing — the art of love. And may you prove, sir, master of your art. Master of the art of love. I tell thee, Litio, this is wonderful. Know, sir, that I am called Hortensio. To tell you the truth, I’m not Litio, and I’m not the musician that I seem to be. I can’t live in this disguise anymore — not for a girl who would turn her back on a gentleman like me, and treat that rascal like a god. You should know that my real name is Hortensio. Hortensio, I’ve heard a lot about your love for Bianca. If you want — since I’ve seen her careless flirting with my own eyes — we can both swear off Bianca forever. Look how they kiss and flirt! Lucentio, shake my hand. I firmly vow never to woo her again. I renounce her! She’s unworthy of everything I’ve done for her. And I take my oath never to marry her, even if she begged. Damn her. Look how shamelessly she flirts with him! That I have fondly flattered her withal. Never to marry with her, though she would entreat. I wish everyone but Cambio had taken the same oath! As for me, I won’t break my promise. In less than three days, I’ll be married to a wealthy widow. She’s loved me as long as I’ve loved this arrogant, disdainful hawk of a woman. So goodbye, Lucentio. I prefer kindness in women over beauty. So I’ll take my leave, keeping the oath I swore earlier. Mistress Bianca, bless you with everything a lover deserves! No, nevermind. We’ve caught you, and so Hortensio and I have renounced you. You’re kidding, Tranio! Both of you? And so farewell, Signor Lucentio. As 'longeth to a lover's blessèd case! “have forsworn you with Hortensio … Then we are rid of Litio." “have forsworn you with Hortensio … Then we are rid of Litio. Tranio explains how he tricked Hortensio into swearing to give up on Bianca. While impersonating Lucentio, Tranio pretended to outraged having “taken [Bianca] napping”, that is, caught her being flirtatious with her language teacher Cambio. Tranio, you jest. But have you both forsworn me? Then we are rid of Litio. That shall be wooed and wedded in a day. That takes care of Litio. He’s going after an eager widow now. They’ll be married in a day. Yes, and he’ll tame her. It’s true, he’s going to the taming school. The taming school? Is that a real place? 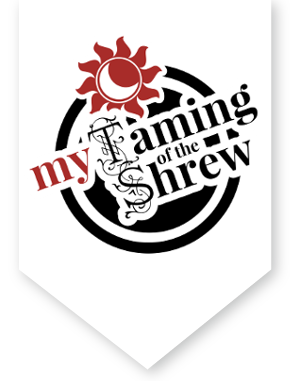 Yes, and Petruchio is the teacher: he teaches just the right tricks to tame a shrew and control her blabbering mouth. Master! Master! I watched for so long that I’m dog-tired, but I finally saw an old man coming down the hill! He should do nicely. Maybe a merchant or a teacher, master, I’m not sure. But in his clothes, his stature and his expression he definitely looks like a father! Why does Tranio think that Hortensio’s going to employ Petruchio’s harsh tactics with the widow he intends to marry? In gait, and countenance — surely like a father. What do you want with him, Tranio? If he’s gullible and believes my story, I’ll get him to pretend to be Vincentio! That way, I can convince Baptista Minola that he’s the right Vincentio. Take your love inside and leave the rest to me. And to you. Welcome! Do you have much further to travel, or will you stop here? I’ll stay for a week or two, but then I’ll keep travelling as far as Rome and Tripoli. And you, sir. You are welcome. This reflects the notion that we owe our souls to God; he has only lent them to us for our relatively short stay on this earth. Where are you from, may I ask? You’re from Mantua, sir? And you’ve risked your life by coming to Padua? My life! What do you mean, sir? That sounds serious. Anyone from Mantua who comes to Padua faces certain death. You don’t know why? Well, our duke is in an argument with your duke. That’s why all your ships were stopped at Venice. It’s been announced and written everywhere! It’s strange that you haven’t heard — it must be because you just got here. Oh no! And it’s even worse for me: I have a check from Florence that I need to cash here. My life, sir? How, I pray? For that goes hard. Hath published and proclaimed it openly. You might have heard it else proclaimed about. The small town of Padua is close to Venice, and therefore under the Duke of Venice’s authority. This will I do, and this I will advise you. Well, sir, out of respect, let me offer you some advice. First, tell me, have you ever been to Pisa? Yes, I’ve often been to Pisa, renowned for its dignified citizens. Do you know one of those citizens named Vincentio? I don’t know him, but I have heard of him; he’s a merchant of incomparable wealth. He is my father, sir. Truth be told, he resembles you. [Aside] As much as an apple resembles an oyster. In count’nance, somewhat doth resemble you. [Aside] As much as an apple doth an oyster — and all one. And in my house you shall be friendly lodged. To save your life in these dire circumstances, I’ll do you a favor. It’s good luck that you look like Sir Vincentio. Here’s what we’ll do: you can take his name and reputation, and live comfortably in my house; all you have to do is make sure you act like him. You understand me, sir? This way, you can stay until you’ve done your business in the city. Accept this as a favor. Oh, sir, I accept! You’re saving my life and my freedom. Then let’s go carry out the plan. By the way, I should let you know — my father is expected here any day now, because he’s supposed to promise payment for a marriage between me and the daughter of a man named Baptista. But I’ll tell you everything you need to do. Let’s go dress you appropriately. Then go with me to make it so.